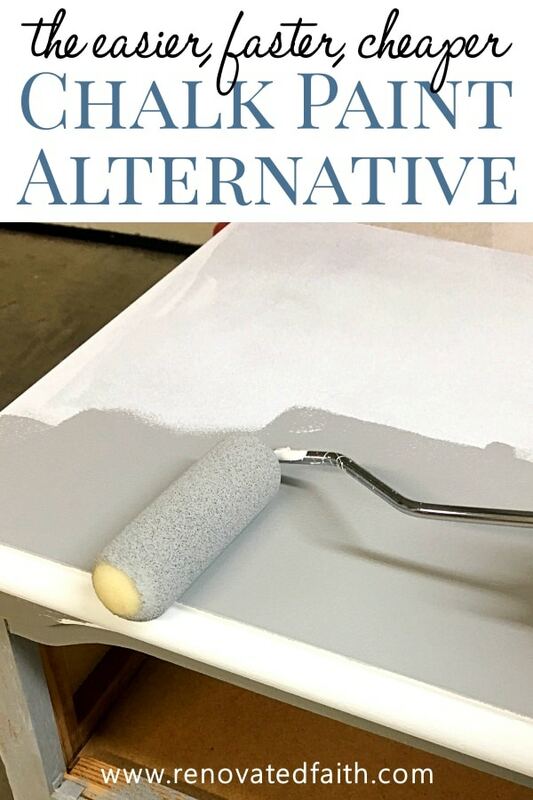 For those of you that want the appearance of chalk paint without the cost and hassle, I’ve found a process that gives you the same look but without the high cost.. With my better alternative to chalk paint, you can even achieve the aged look of dark wax without the extra time involved and I’ll show you the best type of paint for wood furniture. Why is this furniture technique better than using chalk paint and wax? This product is MUCH less expensive. 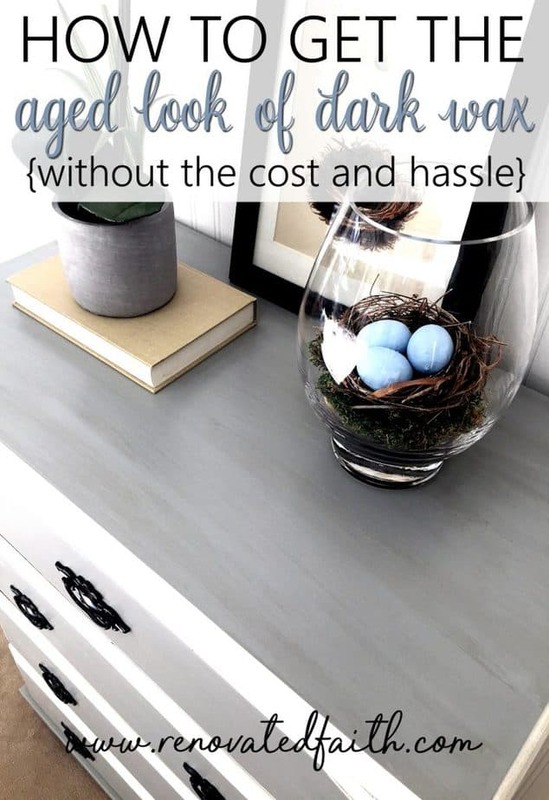 I give a full cost break-down in my post Why I Don’t Use Chalk Paint, showing the drastic expense of chalk paint verses my favorite paint for furniture. Not only is it much cheaper, but it is also easier to use. There is definitely a learning curve when it comes to waxing furniture. With this technique, you can get the same look of dark wax with much less effort. This product is also much more durable, providing a long-lasting finish for years to come. 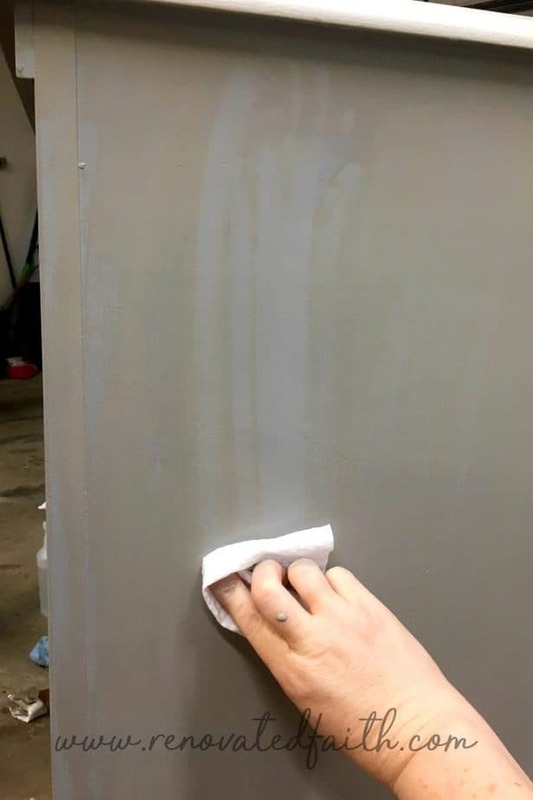 This paint does not have to be sealed with wax. Did you know that if chalk paint is not sealed with wax, it will actually re-liquify if a cold drink is left on it? As opposed to chalk paint, this process gives you almost limited color options. This allows you to better coordinate existing room details or to match another piece of furniture. Last, the supplies are much easier to find as opposed to going to a specialty store. For more benefits to this technique, be sure to click here. As an Amazon affiliate, I earn from qualifying purchases. To see my full disclosure, click HERE. 1 Quart Behr Premium Plus ULTRA Paint in Satin in your color of choice! 1 Quart Zinnser Bullseye 123 Primer – If your paint is light or white, don’t tint the primer. If it is dark, tint the primer the same color. Just ask them to help you at the paint counter. It doesn’t have to be an exact match – just darker than white to give you better coverage. I opt for a shade a little lighter than my final coat. 1 Paint Brush – I love these! Valspar Clear Mixing Glaze and a sample pot of Behr Ashwood (both optional). Many readers ask me how to paint wood furniture without sanding. Unfortunately, if you don’t sand, you risk wasting all of your time and effort because of paint that won’t stick. Fortunately, sanding, if done correctly, should not take you more than 5 minutes with very little effort on your part because you are barely roughing up the surface of the wood to accept paint. You are not sanding to take off all of the old paint as I explain in my post How to Sand Furniture in Less Than 5 Minutes. After taking off all hardware, sand your piece using a mouse sander. Just gently go over the surface to rough it up some. You don’t want to try to take off the existing paint or stain, you just want to take off the shine. Spend more time on scratches and dents as needed. Once you are done, wipe it down with a moist rag. See my posts on how to sand furniture with an electric sander and the best sanders for wood furniture here. 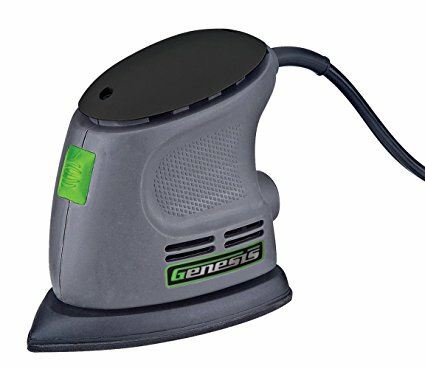 Genesis Palm Sander (Check the current price here). If it goes on sale for under $16.00, that’s a great deal! You can also see the best sanders for wood furniture HERE. For this dresser, I used Zinnser Bullseye 123 in white. This a water-based tintable primer which means that you can have it tinted just like paint. It also settles out really well as it dries meaning that it doesn’t show brush strokes easily. For lighter projects, I just go with a white primer, just as it is in the can. Also, if you are matching other furniture that is white, be sure to match it to the white on a paint deck as there are hundreds of shades of white. Before you start any furniture project, be sure to download my FREE Tips for Painting Furniture for any projects. Don’t start a project without them! The primer takes only 30 minutes to dry. When you’re ready, paint the piece with a roller like THIS one. 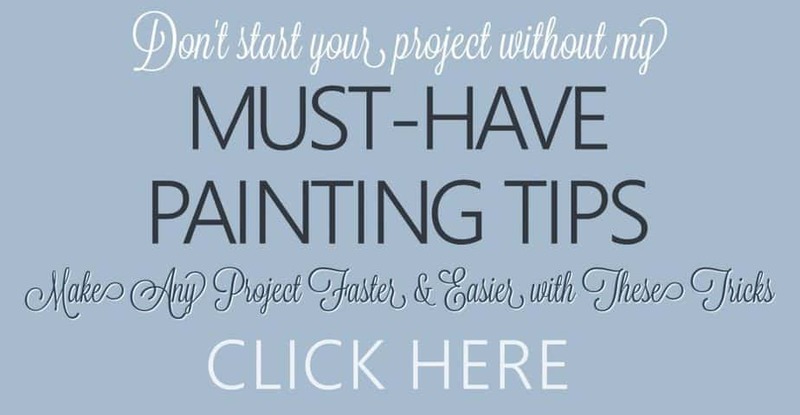 It will also save time on your entire project and gives you a much smoother finish than painting with a brush. You can also add a product called Floetrol to your paint in order to minimize brush strokes. I do this often and love the smooth finish I get every time. Just read the instructions on the bottle for how much to add and mix it in. As I mentioned in my post Why I Don’t Use Chalk Paint on Furniture, I counter several claims when many argue why use chalk paint vs. regular paint. My experience is with high end brands of specialty chalk paint. I didn’t compare chalk paint reviews for the best chalk paint but I feel strongly that any any paint with a chalk-based paint component like Valspar chalk paint and even Rustoleum chalk paint will be an inferior product. Often one of the main criteria for the quality of a paint is whether it has additives like calcium carbonate (the main ingredient of many chalk paints and homemade chalk paint recipes). The more of these additives the less durability the product will have long-term. Now, say you want to achieve the same look of dark wax without the cost and hassle. After your coat of latex paint is dry, mix together a 50/50 mix of the Valspar Clear Glazing Mix and your sample container of paint. 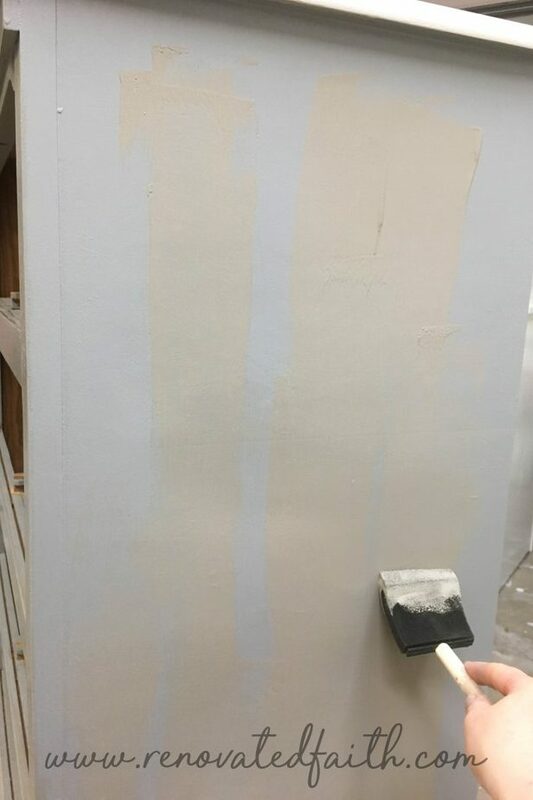 My sample color is Behr Ashwood (Home Depot) which is the same color as Valspar Beige Shadow(Lowe’s,) depending on the paint on the store you are at. 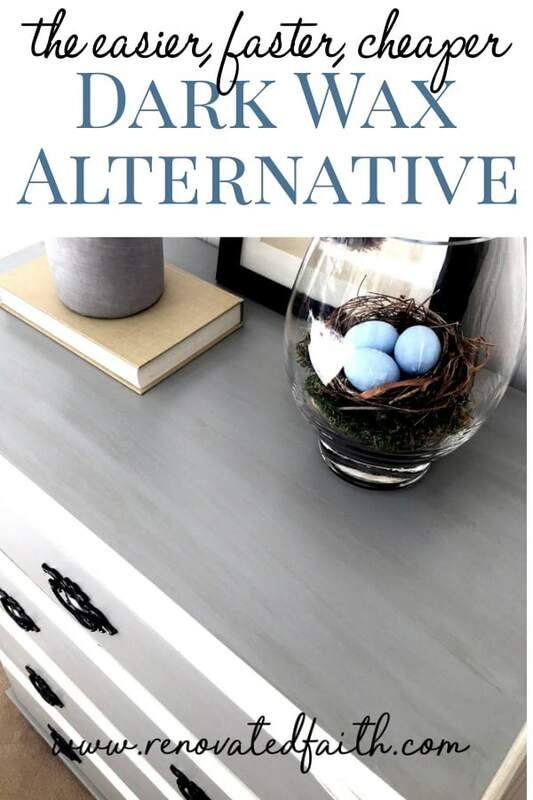 Many readers have asked me where to buy chalk paint but the nice thing about this process is that all the products are easy to find at your local home improvement store. Once I painted on the streaks and covered the majority of the piece I took a baby wipe and started wiping it off. (Pamper’s seem to work well for some reason). This is a really easy process as the glazing medium allows the paint to stay wet giving you plenty of time to work with it. You just keep wiping with your baby wipes in long strokes in the direction of your piece to get the look you want to achieve. Should You Add a Clear Coat on Painted Furniture? For furniture that undergoes a LOT of wear and tear like our coffee table or my daughter’s desk, I added add a couple coats of General Finishes Flat Out Flat clear coat (check the current price here) for extra durability but usually one is enough. What I love about this clear coat is that it will give you the same sheen as chalk paint. Just paint on the top coat with a foam brush like this one. These brushes are so cheap that you can just threw them away when you are done. If I didn’t use this process, the alternative would have been to wax with clear wax and then wax with dark wax to get that look. Both of those steps take a lot of time and there is a definite learning curve with waxing. As I mentioned in my post Why I Don’t Use Chalk Paint, waxed furniture has to be maintained by re-waxing every so often. 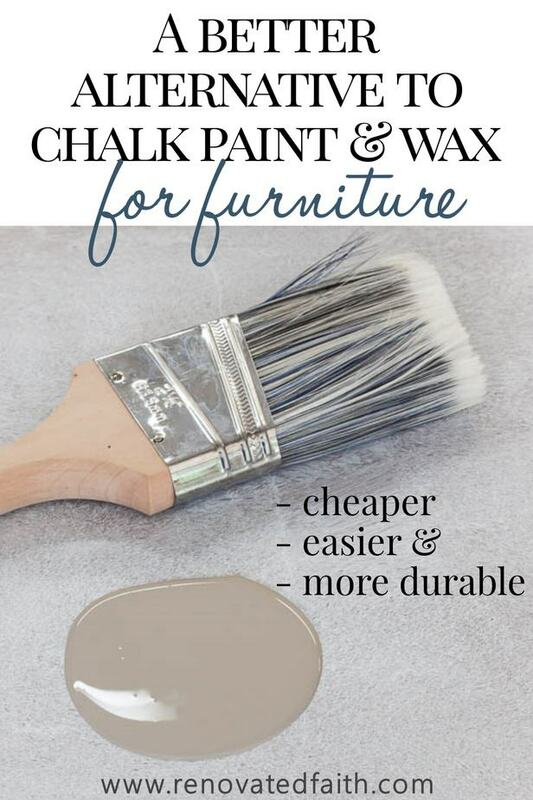 With this better alternative to chalk paint, your piece will look fabulous for decades to come with no maintenance! What is the most durable paint for furniture? Latex is one of the most durable paints for furniture. There are oil-based paints that dry harder but they are much messier and the fumes are an issue. 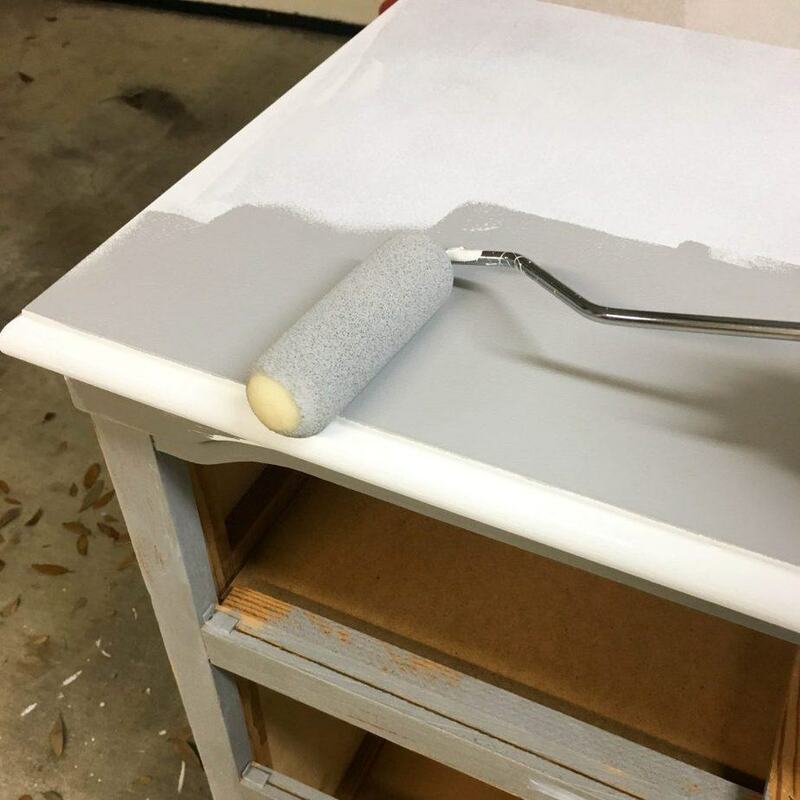 Latex paint does well with protecting furniture from moisture and also has some elasticity that prevents cracking of the paint if the furniture warms over time. Chalk Paint, in my opinion, is not as durable as it is easy to sand off verses a latex paint with primer. Also, as I mentioned in depth here, chalk paint will re-liquify if a drink is set on it and it is not waxed properly. What is the best brand of paint for food furniture? When it come to furniture paint, home depot carries the Behr brand which is rated very highly in Consumer Reports. It provides good coverage while showing very good durability. They also have hundreds, if not thousands, of colors to chose from which is another advantage of using latex paint compared to chalk paint. Should I use a brush or roller to paint furniture? I get this question quite a bit and my answer is BOTH! For the vast majority of your paintable surface, I recommend using a roller. Not all roller are created equal as some don’t provide a very smooth finish. The best paint roller for furniture is the Behr 6″ Best Roller with 3/8″ nap. For more detailed aspects of your furniture piece such as the edges of drawers, feet and molding, use a brush. I like this set of brushes because they are inexpensive while providing a smooth finish and I don’t have to worry about loose bristles getting into my paint finish. What is the best type of paint for outdoor wood furniture? Every type of latex paint has an exterior counterpart. Behr also has a new house and fence paint that is extremely durable. If you use a glaze on outdoor furniture, I would go over it with an outdoor clear coat like this one to ensure the elements don’t wash or damage the finish. Now you have a furniture piece that has the farmhouse look of chalk paint without the extra hassle and expense, not to mention it will have a durable finish for years to come! 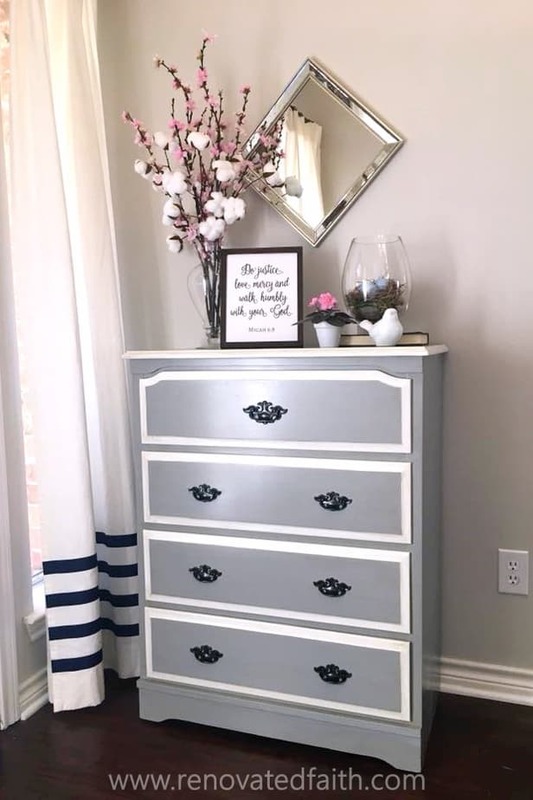 For more inspiration,be sure to look at this gallery of painted furniture or check out the rest of my furniture flips. Did you like this post? Be sure to share it with others. 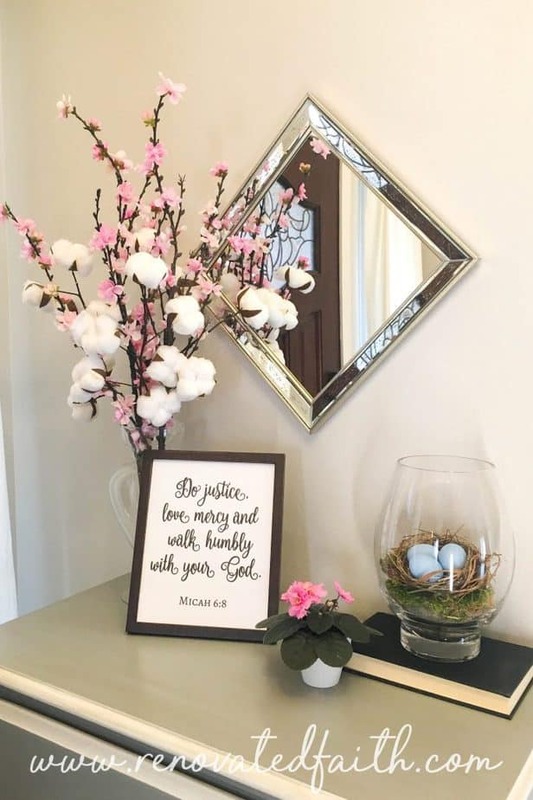 As always feel free to download my complimentary Scripture printables HERE. You have dozens of verses to choose from. Have a wonderful week! There’s a reason that latex paint has been around for so long. It has consistently provided a durable finish with unlimited color options. With the technique I outline above, you can have the same look of chalk paint without the expense and hassle of waxing. Now, it’s time for the only hard part – picking out the right paint color! What are your thoughts? If you have any questions about your furniture projects, I’d love to answer them in the comment section below! If I decide to sand down to the bare wood and I am using a dark paint do I still need a primer? I’ve also heard others say that you do not have to use wax with chalk paint, that you can use polyurethane instead. What are your thoughts on that please? I believe you are on the right track by not using the chalk paints but of course I still have questions. Thanks! Great question! If you are to the bare wood and you are sure there are no oils on the wood (cleaners, etc. ), then you should be just fine with only paint. This is wonderful information! Thank you. In a house of boys I need durability but love the chalk paint look! If I want a distressed look should I go with a darker primer? I plan to paint my piece white but want grey to show through in some spots… I have read about using Vaseline to do this- I’m thinking a grey primer and white paint… what are your thoughts? But, will regular satin paint have that yummy buttery feel of a great chalk-painted piece? Great question Lizzy! I’m assuming you mean the velvety feel of the furniture wax. You can always use clear wax over paint if that is important to you. Otherwise a matte clear coat like the one I mentioned will have a similar feel. Thanks for your comment! Your work is beautiful and thank you for sharing your ideas. I’m no artist, but I have enjoyed painting furniture and transforming junk yard stuff long before it was a popular. Faux finishing and distressing furniture was a lot of fun especially since I never worried about the tools and products I needed. I just used whatever I could buy for cheap, found on clearance, or what ever someone else was throwing away. Sometimes I didn’t even bother to prime my pieces. A light sanding was usually enough unless I was planning on doing a stain finish. I mean no disrespect to the younger generation when I say that all the fancy products being sold now is really not needed especially since social media has made it so easy for people to share their ideas like you have. I believe as long as a person is having fun and is not afraid to experiment or make mistakes then that’s all that really matters. If you have the extra money and would like to try a new product then go for it, otherwise just use whatever you have on hand be it latex, oil based, craft paint, polyurethane, floor wax, cheap brushes, glue, salt ,vinegar, rags, and anything else you have around the kitchen or bathroom closet. I say have fun and then take joy in the fact you crafted, painted, built or repurposed something that you and your family will enjoy and use. I couldn’t agree more Doreen. The best projects are the ones where you use what you have an have fun doing them. Thank you so much for taking the time to share your experiences with DIY. I agree that there’s nothing like the satisfaction of having worked on a piece yourself. Have a great day! Just wondering if you recommend sanding between coats of paint? Great question Sarah. I’m kind of a stickler for a smooth finish so you can to just lightly sound out any brush strokes but its definitely not required. Thanks for your comment and for stopping by!